This collection of control elements and fluorescent reporters can be used in combination with the MoClo-YTK toolkit for protein expression and secretion in Pichia pastoris. A Modular Toolkit for Generating Pichia pastoris Secretion Libraries Obst U, Lu TK, Sieber V. ACS Synthetic Biology. 2017 May 2; doi: 10.1021/acssynbio.6b00337. PubMed PMID: 28252957. This collection of control elements and fluorescent reporters can be used in combination with the MoClo-YTK toolkit for protein expression and secretion in P. pastoris. The Sieber Lab developed the MoClo Pichia Toolkit as a set of genetic parts to control transcription, translation, and protein secretion in P. pastoris. 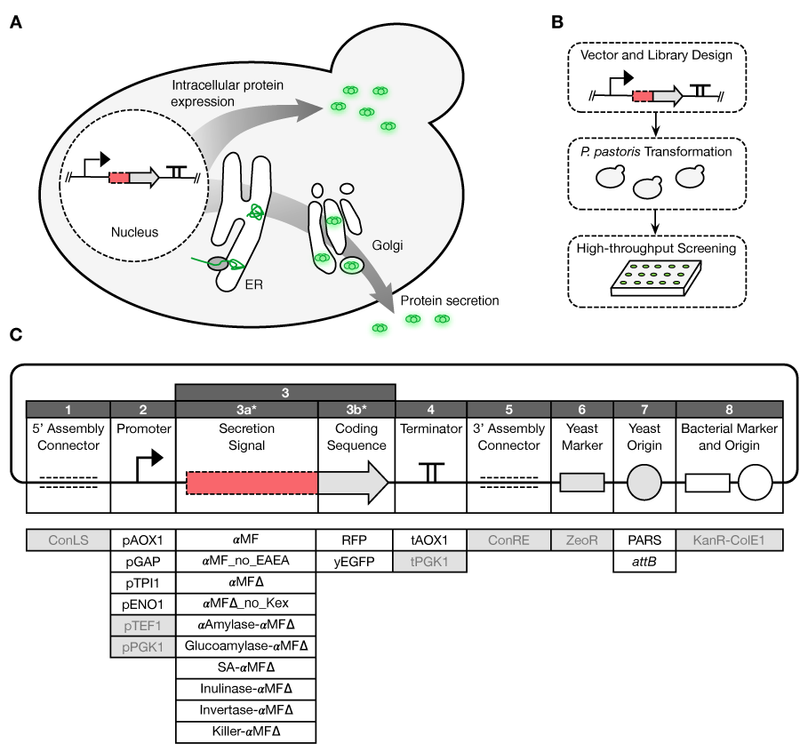 This toolkit will allow for generation of large and diverse secretion libraries in order to explore a wide range of secretion constructs, achieve successful secretion, and better understand the regulatory factors that play a role in protein production. This toolkit contains 17 new control elements specific for P. pastoris. Combining these parts with existing S. cerevisiae parts allows for a gene of interest to be expressed in over 4000 different ways. Figure 1. Pichia pastoris protein secretion platform. Proteins produced in P. pastoris can be expressed intracellularly or secreted extracellularly. The secretion pathway allows the possibility for protein modifications (e.g. proteolytic maturation, glycosylation or disulfide bonds). After P. pastoris transformation, high-throughput screening of expression construct libraries can be performed in 96-well plates to find optimal expression constructs. Standardized and combinatorial assembly strategy for designing expression vectors. Parts are defined by flanking overhangs and are flexible and interchangeable. For intracellular protein expression the coding sequence must be designed as a part with type 3 to ensure the correct overhang to the previous part type 2. For protein secretion, the secretion signal (part type 3a) and the coding sequence (part type 3b) are needed. White boxes correspond to new Pichia toolkit elements developed in this study; gray shaded boxes are taken from the existing MoClo-YTK toolkit. (Image with permission from ACS Synthetic Biology. Copyright 2017 American Chemical Society).